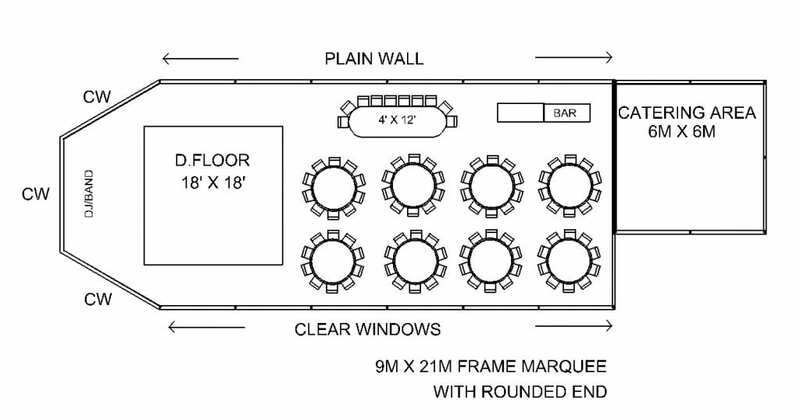 It might seem funny to write about wedding table layouts but actually it is quite an integral part of your wedding marquee and how you want your marquee to look and guests to mingle. What sort of layout works in the space? 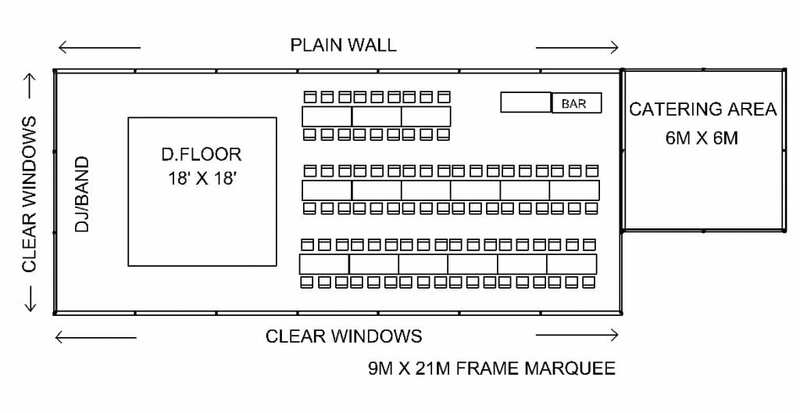 In a marquee, its quite easy, as you should have a suitable size space for the number of guests. 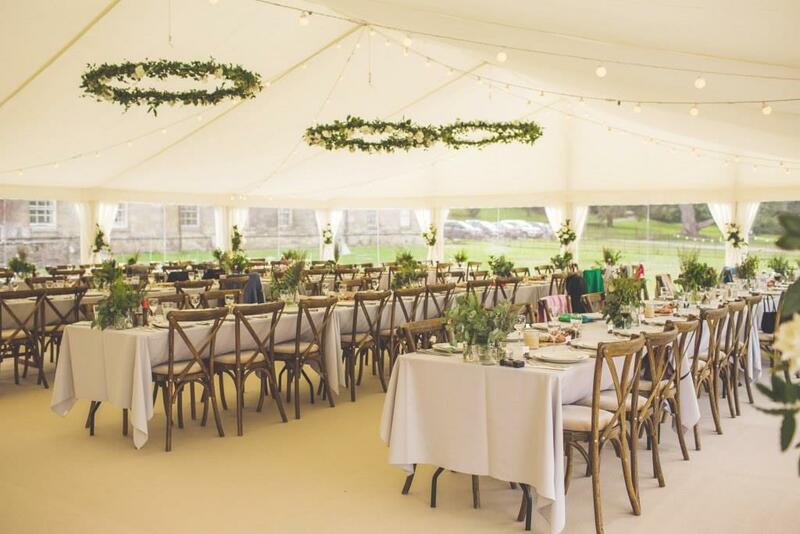 In a frame marquee it is even easier as you don’t need to negotiate internal poles which can restrict where you put a dance floor or dining tables. First consideration is whether you want round tables or trestle tables, in long rows of smaller groups. Round Tables: we generally use 5’6″ round tables which seat 10 people, although you can have 6′ rounds (seating up to 12 people) or 5′ rounds (seating up to 8 people). Round tables enable all guests to be able to chat together, which is great whether you have a group of close friends or are gathering people that perhaps haven’t met before. 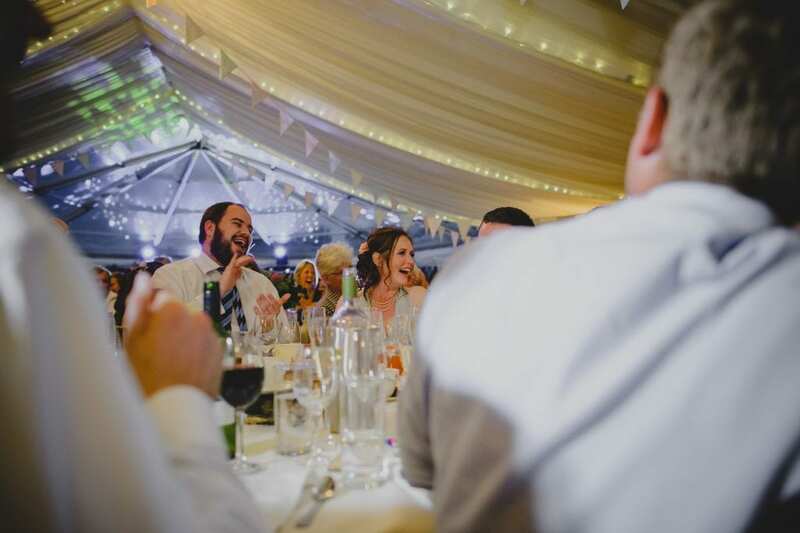 Just one thing to think about if you want the table conversation to flow; avoid large, tall, bushy table displays which look fantastic but mean the guests can’t see who is on the other side of the table – they can inadvertently be a conversation stopper ! Trestle tables: (6′ x 3′) are used to sit 6 people (3 along each side) and can be used singularly or for banquet style dining, placed end to end in twos, threes or more. They are really adaptable and can be set up in different arrangements and look really stylish with decorations running the length of the tables. But it is possibly a little less sociable as you don’t have the ability to chat with as many people, especially if you are sat on the end of a run of tables. 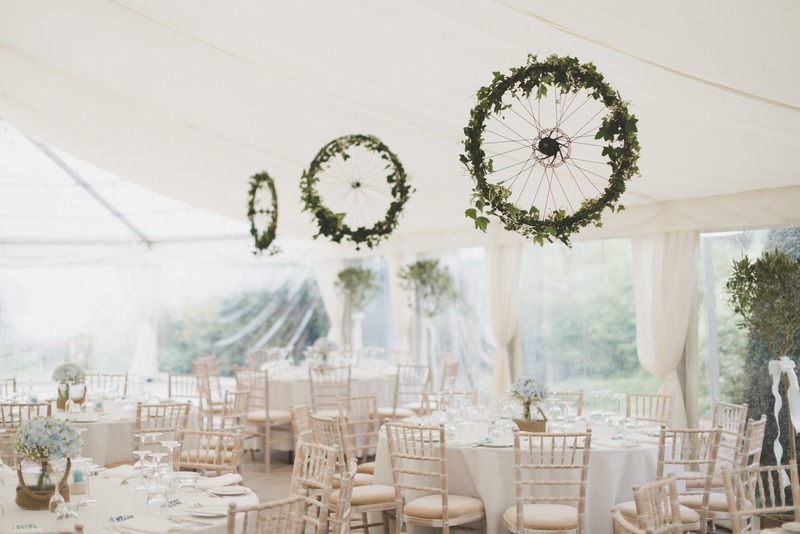 Both trestles and round tables need to have tablecloths with the exception of a new rustic wooden trestles which have a fantastic thick wooden top, white legs and look fantastic, however, you choose to decorate. Do you have a top table? It’s up to you! 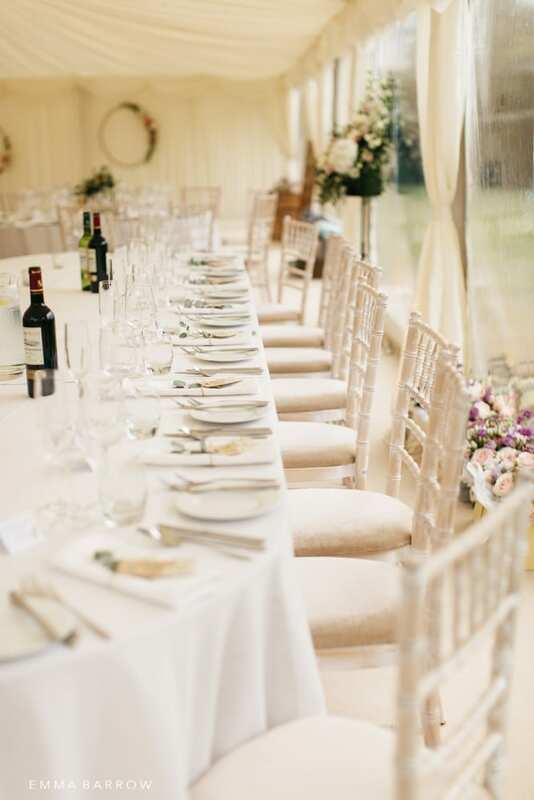 When you think of a top table, it’s usually a long table with seating just on one side – we offer an oval table which allows those seated on the ends to be just seated on the rounded end which means that they can speak with others on the table more easily. A long top table means that you can see all your friends and family and interact with them a little during dinner. Alternatively you can use a round table, which is less formal and allows the bride and groom to chat with all those on the top table. Who do you sit with who? When you are gathering a group of friends and family, inevitably there is a bit of shuffling around when it comes to seating arrangements. Try not to get to bogged down with it, generally keep couples together and mix people up a bit, try to put at least a couple of people, who know each other, on each table – it helps get guest chatting. So whatever your ideas for your special day, have a think about how you want to use the space and what works best for you. 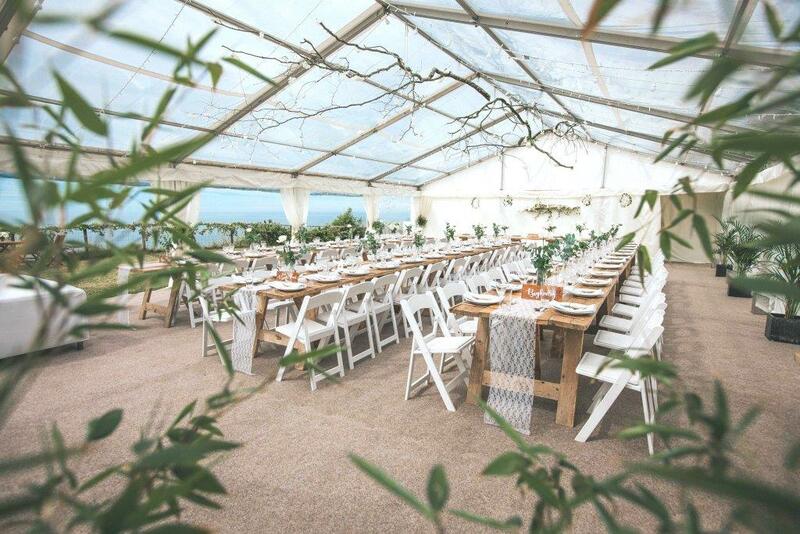 For information and advice on arranging a marquee wedding take a look at our blog ‘Marquee Weddings – is there a lot to arrange’, ‘Decorating Your Wedding Marquee – tips and ideas’ or for more information on marquee hire in Devon, Cornwall, Dorset and Somerset visit Hatch Marquee Hire, specialists in wedding marquees. Please help spread the word by sharing our post with your friends, using the links below. Thank you!